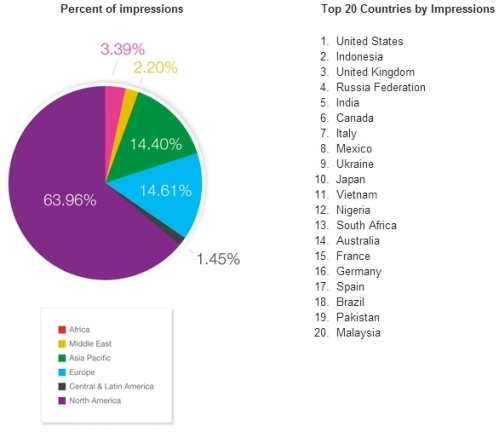 Europe’s share of mobile ad impressions were at 14.61% in the fourth quarter of last year. The figure rose 4.6% from 10% in 2012’s third quarter, according to newly released data from Opera. As a region, Europe is just in front of Asia’s Q4 2012 share of 14.4%, but quite a way behind the USA and Canada’s majority of 64%. However, North America’s lead is by no means set in stone. In the three months since Q3 2012 it dropped 6% from 70%. Ashu Mathura, CEO at MADS, revealed findings of his own that are at odds with Opera’s, but advised taking statistics of this kind with a pinch of salt. The numbers are from MADS’ own network and not representative of the world at large. Russia is Opera’s biggest mover in terms of mobile ad share. Halfway through 2012, the country was ranked seventh in the browser technology maker’s list of markets with the most ad requests. In Q4 it ranked fourth with an increase of nearly 60% between Q3 and Q4.